In the spirit of “pulling together” let’s tackle the problems of our four legged Tornado victims. Keep reading! Click on links and go directly to the Red Cross Website to make a donation for disaster relief. If you are near the affected area, some of these links will lead you to specific lists of items that you can bring or send to the various shelters that are trying to help the devastated areas. ALABAMA (ANIMAL RESCUE) – Between Japan’s earthquake and tsunami and now the Southern state tornadoes, Mother Nature has been on a carnage bender the past couple of months. But as they say, it’s not what happens to us, but how we respond that’s important. Global Animal Foundation is collecting donations on behalf of vetted rescue groups on the ground working to shelter, feed, rehabilitate and reunite pets with their guardians. BIRMINGHAM, Alabama — After the deadly storms that ripped through Alabama and the rest of the deep south on Wednesday, both people and pets are trying to recover and get their bearings. The barrage of storms battered the region, wreaking havoc and razing buildings down to the slab, killing at least 291 people across six states. Most of the deaths, 204, were in Alabama, with Tuscaloosa bearing the brunt. Thousands more have been injured, and untold more have been left homeless, hauling their belongings in garbage bags or rooting through jumbled piles of wood to find anything salvageable. Across nine state there are power outages and thousands of homeless people staying in Red Cross shelters. The site, titled Animals Lost & Found from the Tornadoes in Alabama on 4/27/11, was set up by a group of Alabama pet rescuers. It’s acting as a central location for people who have lost or found animals or who want to volunteer to foster displaced animals. There was also information about veterinarians providing free services in storm-damaged areas. The Greater Birmingham Humane Society has also been listing lost pets on its website and has tips for how to best search for a lost pet. The Greater Birmingham Humane Society has a great website that has concrete good information for how to help those in this disaster. Japanese Aid – Time for the Internet Twilight Bark! Remember 101 Dalmatians. In that classic film, Pongo and Perdita use the Twilight Bark to get help from all the dogs they can to find their stolen puppies. 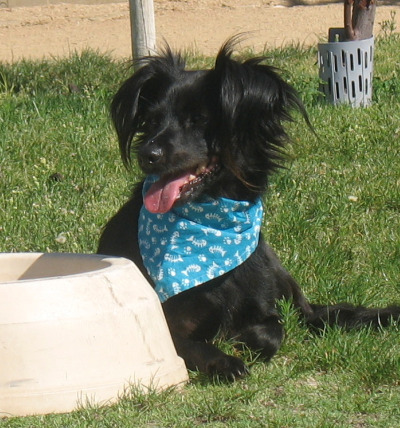 Guido Needs a Home – Let’s Give Him One! It’s Pet finder’s Internet Day! What does that mean? It means that Opie and I have pledged to tell at least one person about a pet that needs adopting! We’ve decided to tell EVERYONE on the INTERNET about GUIDO! 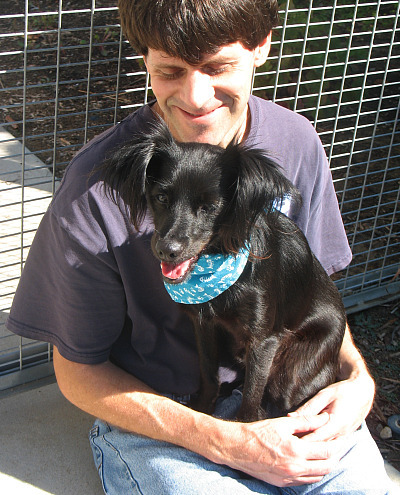 You’ll want to adopt Guido when you hear his story. 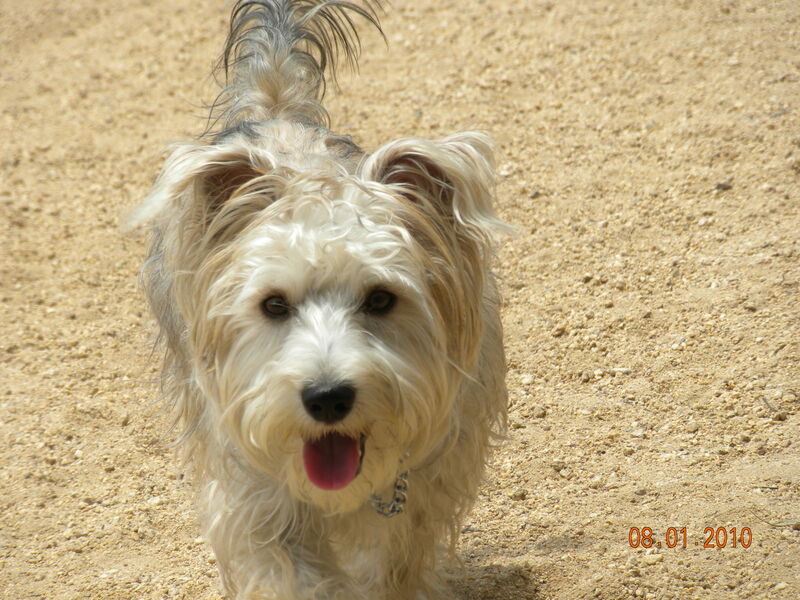 Guido is being taken care of by Lhasa Happy Home Rescue. Just a little background. When we made the decision to adopt a dog, we looked on Petfinder.com. We knew if we went directly to a shelter we’d end up with a dog we loved, but that might be completely inappropriate for our family. I would happily have spent the rest of my life on allergy medication with the pup we fell in love with. However, that was not the right thing for us to do. It’s not the right thing for anyone to do. Find the pet that fits you and your family. If more people did this, I believe we’d have fewer dogs in shelters and in trouble if people used their heads just a little bit. We found Opie on Petfinder.com , but he was being taken care of by Lhasa Happy Home Rescue. Guido is one of Lhasa’s dogs. Here is a cut and paste of his story form Llasa and some adorable pictures. THIS IS GUIDO….and a luckier boy you will not find. This handsome, 17 lb, white, 3.5 yr old, Lhasa Apso was dropped off at the vet to be euthanized because his owner just didn’t want him anymore. No reason given, she just didn’t want him. His guardian angel, Tori, saw him and said, $#@? She took him home and said to this almost perfect boy, “we’ll find you a home” and she called Lhasa Happy Homes! We’ll never be able to understand his human’s mindset…but we are grateful to Tori for saving Guido’s life. Tori reports that this boy is a stud! He is a lhasa with long legs, but a purebred who did come from a pet store in Westminister originally (birthday March 3, 2007). He is good with older kids, dogs, cats, men, women…you name it! He is a dog for all seasons! He loves to ride in the car and is a perfect gentleman; does need some leash training, but does love his walks! He doesn’t like crates, but is fine when he is getting groomed. He loves toys…and is a little hard on them — so please have plenty back-ups ready! He isn’t a barker, but will whine if he is left alone….still probably suffering from being abandoned….but likely will get over this. He would love to be in a home with another dog…or a cat….he LOVES cats…and will give you kisses to show you how much he appreciates your caring for him after he knows you better….oh yeah, and he will sleep at the foot of your bed and move the toys off to make his comfy place! He is a very loving dog who just wants to be back in a forever home where he can cuddle and love you …and let you know he truly wants to be your very best buddy! If you love the breed, you’ll love Guido! We hold our weekly adoption events most every Sunday at MY PET NATURALLY (check calendar link below for special events and directions). 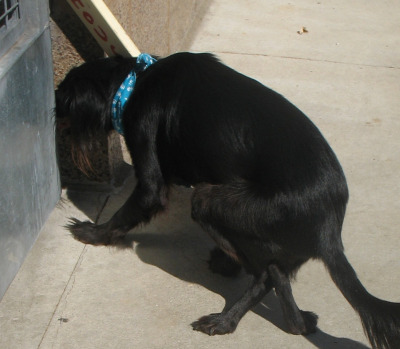 Here you will have an opportunity to interact with the dogs and see which might be a perfect fit with your household! 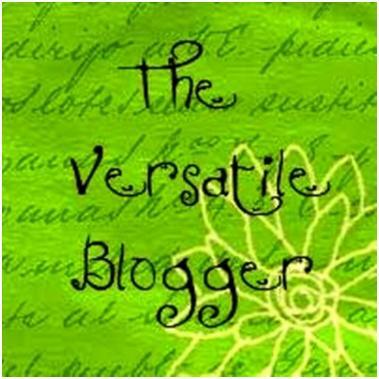 Our website is updated daily. Please do not apply for this dog unless your home fits the specified criteria. All our dogs are spayed/neutered, microchipped, groomed, vet checked, dewormed, deflea’d and come with a leash, collar and LHH ID tag! Thanks for considering saving a life…it will be the best gift you ever give yourself or your family. 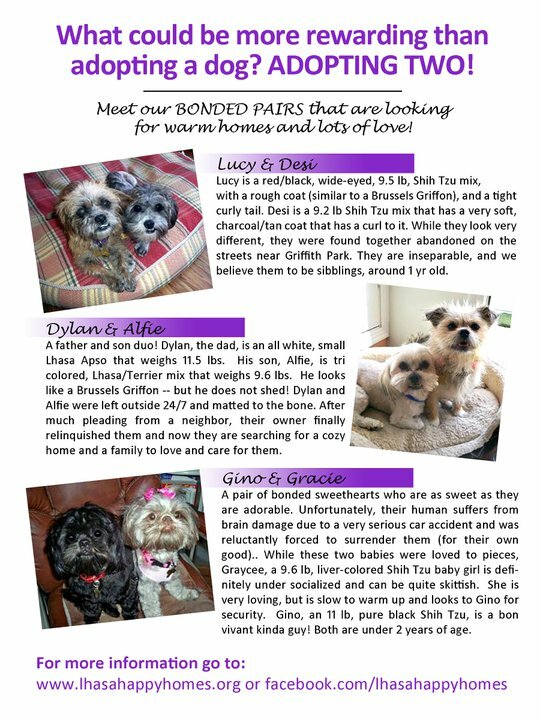 If you are interested in any other dogs from Lhasa please enjoy the following slide show! It has sound. 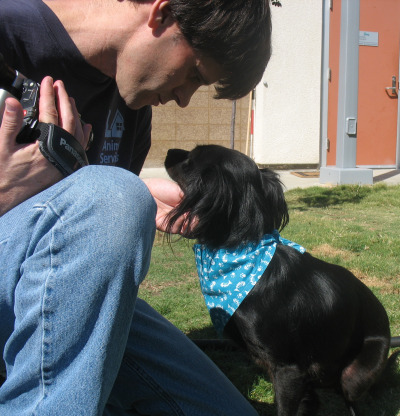 Adopt a Special Needs Pet and get Extra Special Love! Attention Southern Californians in the L.A. or South Bay area! I recieved a great email from my friend Deborah Weinrach of the Culver City Friends of Animals Society! I want to share it with all of you. Maybe you have room in your home for an extra special dog that can give you extra special love. Hasn’t A Clue She’s Different From Other Dogs! 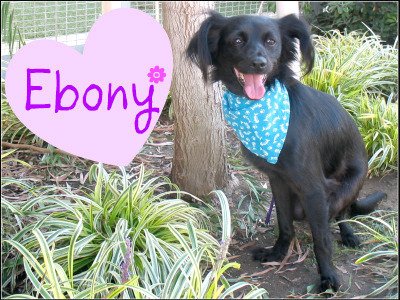 EBONY – 3 yo female Spaniel Mix – URGENT!!!! 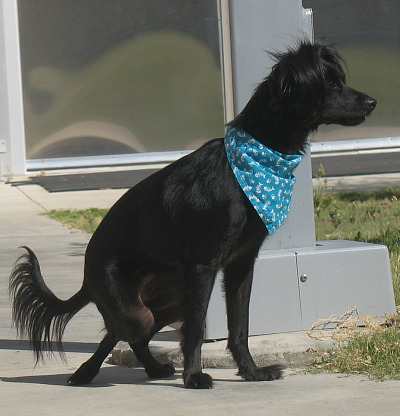 EBONY is a 3 yr old female Spaniel Mix who came to Harbor Shelter as a stray on August 22. Sweet Ebony is SPECIAL NEEDS – she has a congenital deformity resulting in her hindlimbs being contracted into a flexed position. Ebony doesn’t seem to be aware that there is ANYTHING wrong with her! She gets around just great & is very functional – sometimes hopping on one hindlimb, and other times using both hindlimbs. Ebony is exceptionally sweet, loving, affectionate, and a very happy girl….. she enjoys both human time and playtime w/ her kennel mates. She loves “lap time”, too. This very special little girl does not have a clue she is a bit “different” from other dogs….. making her all the more special!!! please contact Harbor Shelter ASAP!!! I never forget that I was a rescued dog. Please note the intake date. I don’t know what Ebony’s execution date is or if she has one yet. Mine was about 30 days from the date of my intake. Lhasa Happy Home Rescue grabbed me 3 weeks before my date. I was adopted by my mom, and I am so happy and so loved. You can make Ebony happy too. We doggies have a lot of love to give. We don’t talk back ( much). We don’t judge at all. We listen to your troubles. We lick you when you need it and we cuddle you. We make you laugh and smile. We bring joy to your lives. We don’t ask for much. Food, a good place to sleep, a chewy toy and walkies so we don’t make a mess. Sombody please help Ebony. She looks nice! Help 4 Million Dogs Across the Country! Hey everybody! I’m jumping on the band wagon to help ownerless doggies get a good meal and in some cases get a good owner. I’m jumping on the band wagon with Bocci from Bocci’s Beefs and Pedigree Dogs to put a free meal in a hungry little dog belly, or maybe a big doggy belly! Go to face book and click on the DANG Button! Don't click it here! Bocci points out that every year, more than four million dogs end up in shelters and breed rescue organizations. Hello! That’s scandalous! Obviously, these dogs need owners, but that’s a lot of dogs, and they have to eat, right. Pedigree has stepped up to the plate ( pardon the pun) and will donate food for every person who becomes a fan of theirs on Facebook. I already did my part, and some pup is going to have a meal today that might otherwise not have. 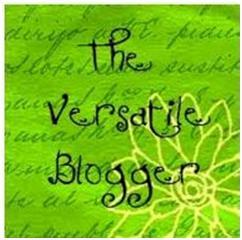 You can go to this link to become a fan. www.facebook.com/Pedigree?ref=ts. I hope my readers will take full advantage of this great opportunity to help millions of homeless dogs. How often do we really get a chance to help our little furry friends en masse? Okay now, if you want the dogs to have more, then post on your blog about this drive. 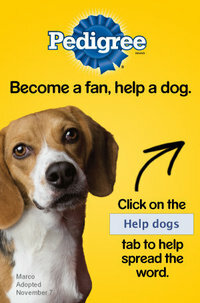 Pedigree will donate one 20 pound bag of food to the shelters for every blog posting. How does that work? 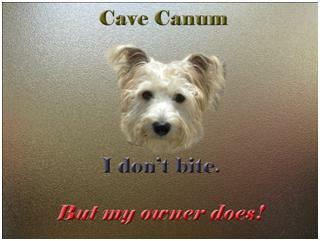 Make certain you have the words, Dogs Rule and Pedigree Adoption Drive. Their search engines will find those key words and Presto — Huge bag of food for pups to eat on for a while! That works for me! Please remember that Opie was once one of these millions of dogs. I see pups every day on Petfinder.com who’ve been rescued by foundations or are slated for execution because of this terrible situation. 2. And if you blog, do a quick blog about this, so that Pedigree automatically donates a 20 pound bag of food. Yeah! Dogs Rule and Go! Pedigree Adoption Drive! What can you do locally? Now, for my Angeleno buddies, what can you guys do? Well, you can do this thing easily. But there’s one other thing I’d like you to note. Go to Face book and donate or sponsor somebody! 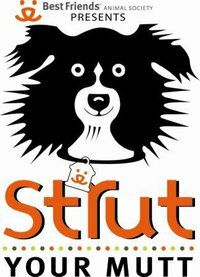 September 19th there will be a STRUT YOUR MUTT fundraiser. 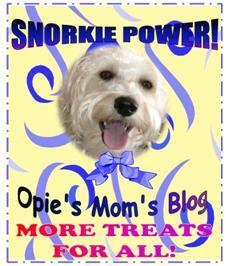 I’ve been invited by Randee Goldman the founder and owner of Lhasa Happy Home Rescue, the place that rescued Opie. I have a very warm place in my heart for this organization. We will be doing a 1 mile walk to raise money for Lhasa Happy Homes, in conjunction with Best Friends, in an effort to put an end to homeless pets. All donations are 100% tax deductible. Please join our “Dog Pack” and walk with us (and your pooch!) or just sponsor one of our walkers. EVERY PENNY raised goes directly to saving lives as we are a volunteer based group. HELP US SAVE INNOCENT LIVES!!! We appreciate your support! Message us with any questions and join us in Struttin Our Mutts! This can be a great week for dogs. Let’s feed our homeless and hungry pups! 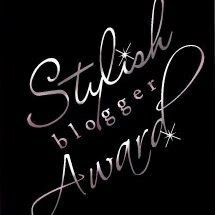 Let’s Strutt our Mutts!